Catherina over at Just the Vax gave us all a reminder of the real impact of pertussis, or whooping cough. In that vein, this post is in tribute to those who have lost their lives to pertussis this year. My heart goes out to all of these families. Please go out and get your boosters and learn what to look for. The other day I shared a little bit of insight into how my brain works at times. Subject associations lead from one thing to another, and before you know it, what began as a relatively mundane musing has taken on cosmic proportions. I certainly never thought that, waking up with the beginnings of a cold, I would end up writing about how a lack of gravity would affect medical care in space. At any rate, the common cold has been bounding about my head (both as a topic and somewhat more literally). While I've been fortunate in that I've only really had to deal with a stuffy nose and only a minor cough, some of my coworkers have been less fortunate. Some manner of respiratory illness has been making the rounds, resulting in some of my workmates having been home for a day or two, both before I got my cold, and after. Talking to them, some actually brought up the subject of pertussis, or whooping cough. No one really knew much about it or what the symptoms were, but it's been in the news a bit lately, with a current epidemic in Washington state (1,484 cases reported as of May 12 [PDF], 2012, compared to 965 cases in all of 2011 and 608 for all of 2010), as well as smaller outbreaks in other states like Montana (142 cases), Idaho (31 cases, including 1 death), Iowa (150 cases), Wisconsin (~1,900 cases, including 1 death), Maine (55 cases [PDF]), Florida (112 cases [PDF]) and others. I figured it might be a good idea, then, to pull some stuff together about the differences between a cold and whooping cough. The other morning, I awoke with my nose deciding it didn't want to function properly and allow me to breathe through both nostrils. The harbinger of a cold, one nostril was stubbornly blocked with the various accumulations of the night. Lovely image, I know. Personally, I blame the exertion and physical stress (particularly the dunking in cold water and subsequent extreme chills) of the zombie run for this state of affairs. I mean, trudging through wet, muddy trails with hundreds of other people in relatively close proximity, dunking in icy water and waiting (soaked) for the better part of an hour in the breezy cool of a spring afternoon can't be all that good for you. Couple that with staying up late and waking early and voilà. A cold. I actually have a point for relating this. You see, as I commuted to work and noticed my breathing passages start to open, I mused upon what a cold must be like in space. We take for granted that gravity helps our sinuses and nasal cavities drain. But in space, where there is no (or only a weak) gravitational field, would someone with a stuffy nose find absolutely no relief from natural drainage? How would the lack of gravity affect blowing one's nose? Would it be easier or harder? As I pondered these questions, my mind began to drift toward bigger issues. I might be stepping on Phil Plait's area a bit, but I hope he won't mind. What about more serious medical care in space? This past weekend, I ran the Run for Your Lives zombie 5K obstacle course. The race served a couple purposes for me: 1) it was a good motivation to get back into running on a semi-regular basis and 2) it served as a good hook to raise money for vaccine research. Just to recap, I was raising money for the Vaccine & Immunotherapy Center at Massachusetts General Hospital. Specifically, they have two projects that caught my attention: creating an improved cholera vaccine and developing a laser-based vaccine adjuvant. My goal was to raise $3,000, and toward that end, I issued a challenge that if I hit $2,000 by race day, I'd double my personal donation. I'll come back to this later. My news alerts have been populated, lately, with numerous stories about pertussis outbreaks in the U.S. 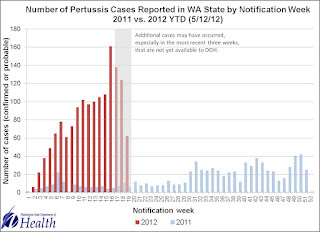 The biggest, currently, appears to be in Washington state, with over 1,100 cases so far this year, compared to a total of 961 cases of pertussis for all of 2011. 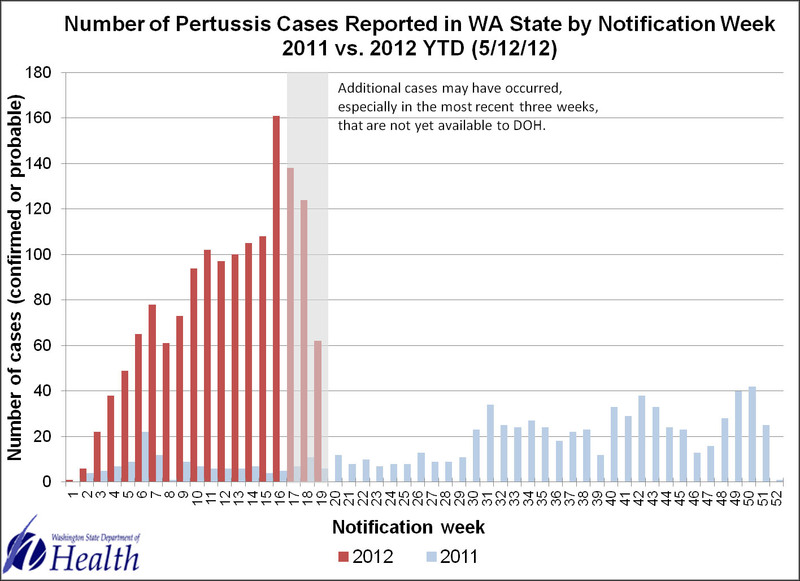 But Washington isn't the only state seeing outbreaks of pertussis. Most likely due to a combination of lower vaccine uptake rates coupled with teens and adults skipping their pertussis boosters, Wisconsin, Illinois, Iowa, New York, New Jersey and others are all seeing outbreaks of an easily preventable disease. As these news items have cropped up, I began to see a pattern, that what started in California two years ago is making its way eastward. Whether this pattern is real or just an artifact of news reports, I'm not certain, but it did bring to mind a tool that is very helpful in examining progression of outbreaks from year to year. I attended the fourth annual Northeast Conference on Science and Skepticism, or NECSS, April 21-22. This is a conference that was put together by the New York City Skeptics and New England Skeptical Society, the folks that bring you the weekly Skeptics Guide to the Universe podcast. Since I had such a great time last year, I decided to go again, for my sophomore year of NECSS attendance. As with last year's account, I think it is good to take a moment to address just what "skepticism" actually involves. In popular reference, it's generally taken to refer to someone who just doesn't believe X, and that's the end of it. There's not really a provisional approach to whatever X is. 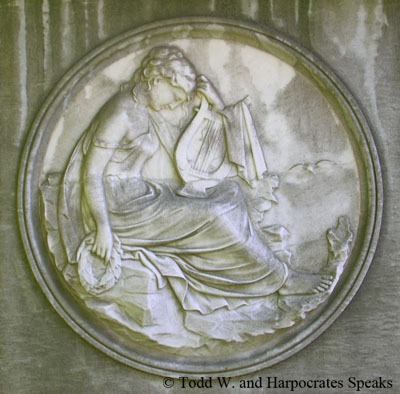 When it comes to topics that tend to crop up among the skeptical community, such as alternative medicine or UFOs, proponents of those topics sort of sneer when they use the word "skeptic", almost as if it's a pejorative akin to many a four-letter-word. But those who espouse a skeptical approach, whether they self-identify as skeptics or not, view claims based on the evidence available and follow where it leads. Sometimes the evidence changes their minds; sometimes it is insufficient to do so; but always a position is provisional, since you never know what new information will come their way. With that out of the way, on with the show. Just a quick exhortation and reminder to all of my readers regarding my race to raise funds for improved vaccines. This Saturday, I will face the hordes of undead at Run for Your Lives. My goal in running this race is not only to finish (and stay "alive"), but also to raise money for two projects at the Massachusetts General Hospital Vaccine & Immunotherapy Center (VIC): an improved cholera vaccine and development of a novel laser adjuvant for vaccines (which may replace aluminum adjuvants). I'm adding another carrot to tempt you to give. The folks at MGH have been great in getting me updates as to how much money I've raised. As of this writing, I'm at slightly over $1,000 raised for VIC. If my total hits $2,000 by Saturday, May 5, I will double my own personal donation. If you have not given, please consider doing so. You can find more information on my blog or on this site MGH helped me set up. If you want to skip the discussion about the project and just make a gift, you can go to the actual donation page. MGH is a registered 501(c)(3), so donations are tax deductible. You might also want to contact your employer to inquire about matching gifts. Most companies will match donations to hospitals above a certain amount (usually $25). Finally, if you happen to live outside the U.S., keep in mind that if successful, this research would have a global impact. So, make a gift, tell your friends and make me double my own gift.